Firsthand accounts of American slavery are certainly a limited treasure. Any opportunity to read a description of what being subjected to the institution was like is not only hard to come by, but also a gem of African American history. That’s why a University of Texas at Arlington student was so delighted, when she discovered one of the earliest poems by Jupiter Hammon, the country’s first published black writer. Julie McCown, a doctoral student, found the poem while researching Hammon. 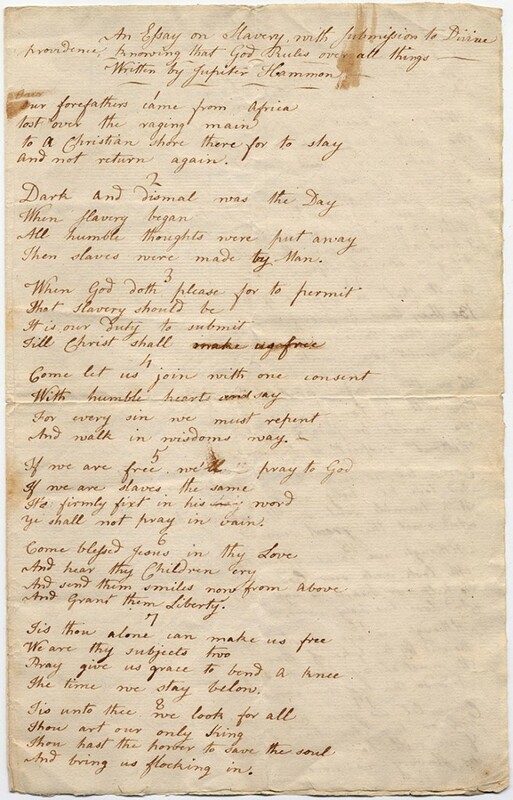 The poem Cown discovered, which is dated 1786, was buried in documents at the Manuscripts and Archives at Yale University Library in Connecticut, and was in immaculate condition. It is a rare find among accounts of slavery in the United States. One letter from former slave Jordan Anderson, who was freed from a Tennessee plantation, is not only world-renowned and taught by historians, but it has also been praised as a masterpiece of satire. UTA professor and expert on African-American literature, Cedrick May said he’s sure there are more lost works by Hammon and others that could offer deeper perspective into the lives of American slaves. CORRECTION: A previous version of this story incorrectly reported that Julie McCown was a student at University of Texas. We regret this error.